The Luxul AMS-1816P and XMS-1208P network gigabit routers are designed to provide an affordable means to expand network connectivity. 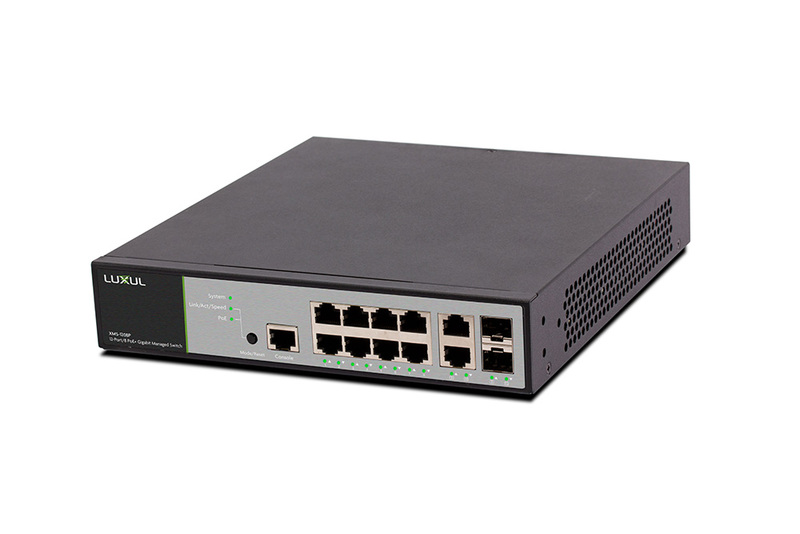 Newly announced, the Luxul AMS-1816P and XMS-1208P (pictured) gigabit network switches support a range of IP applications that include powering access points, IP network cameras and VoIP. Supporting a range of networked technology needs, the new Luxul AMS-1816P and XMS-1208P managed gigabit switches include PoE+ to deliver turnkey network expansion capabilities. Luxul says the 18-port/16 PoE+ L2/L3 AMS-1816P and 12-port/8 PoE+ XMS-1208P gigabit network switches are plug-and-plug solutions that include easy-to-use interfaces, as well as QoS and VLAN support. "For CI integrators in residential and commercial markets, our AMS-1816P and XMS-1208P combine the power and functionality of a managed switch with unmatched flexibility," says Mike Grubb, vice president of marketing, Luxul. "The switches' scalability, high-speed performance and simple installation allow them to meet the requirements of installations of any size—all at unprecedented price points." Engineered to provide installation professionals with options to ensure network reliability, the new Luxul network switches feature port auto-recovery and power scheduling. Port auto-recovery allows the switches to power cycle unresponsive PoE devices, and the port power-scheduling option enables the switches' PoE ports to turn on or off on a schedule. The 18-port/16 PoE+ L2/L3 AMS-1816P comes with two 10 gigabit RJ-45/SFP+ combo ports to allow high-speed interconnections between SFP+ and compatible Luxul switches. The 12-port/8 PoE+ XMS-1208P switch incorporates a pair of gigabit RJ-45 ports, along with two SFP ports to enable integrators to connect devices or additional switches using either Ethernet cables or fiber-optic cables. 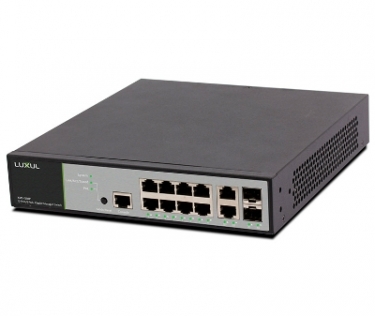 Luxul says both gigabit switches complement a variety of usage scenarios, including powering touchpanels, VoIP, IP security cameras, and wireless access points (WAPs) via the switches' PoE+ ports. The switches deliver power and high-speed data to 802.3/af/at-compliant devices with a total power budget of 185 watts for the AMS-1816P and 130 watts for the XMS-1208P, all while using standard network Ethernet category cables. To help keep racks clean, the AMS-1816P features rear-panel ports, user-selectable, front-facing green or blue LED indicators, and variable speed fans. The XMS-1208P incorporates front-facing ports, along with a fanless cooling design, and integrators can place this switch in a rack or flat surface.